Uber and Lyft provide $1 million of liability insurance. Let’s find out if you are covered. If you were involved in a ride-share car accident, you should contact the Uber Accident Lawyers at Adley Law Firm. They are skilled in ride-sharing car accident cases and will make sure that you are compensated fairly. Call us today at (713) 999-8669 to schedule a free consultation with one of our ride-share attorneys. Or send us an email through our online contact form. Ride-share companies like Uber and Lyft have made transportation easier, cheaper, and convenient for passengers to travel effortlessly through the convenience of a phone app. However, just like any other vehicle there is risk of an accident to occur while traveling to your destination. Click to learn more about how we can help drivers involved in a ride share accident. Click to learn more about how we can help passengers involved in a ride share accident. If you get into an accident, Uber and Lyft’s $1 million insurance policy will pay out liability and collision but they usually don’t cover rental cars, present and future lost wages, medical bills, pain and suffering and more. The $1 million liability coverage only applies while you’re on a trip or en route to pickup a passenger. 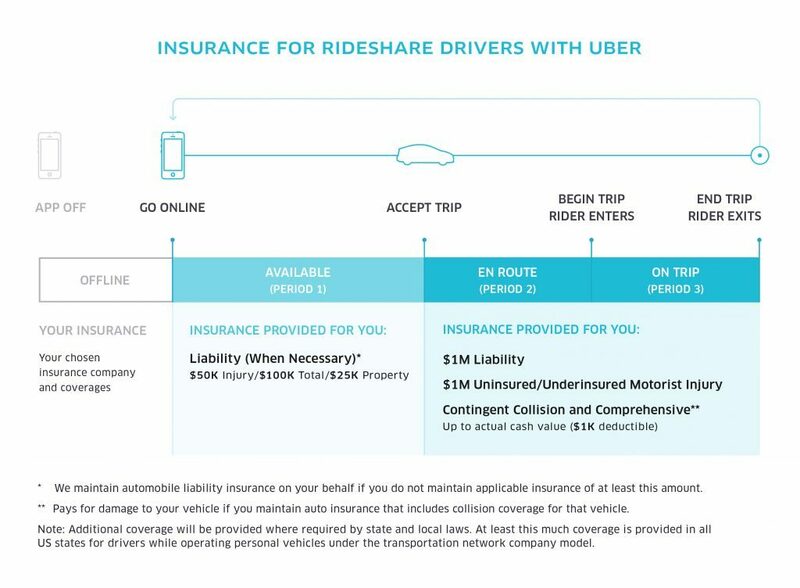 So it is advised that you still have ride share insurance to cover you while you are in period 1 or while on ‘available mode’, see graphic below for a visually detailed explanation. If the other party is at fault, you can use their insurance company to try and reach a settlement. Property Damage: You will want to get your car repaired quickly to resume driving. Lost Wages: Because you are a ride share driver, you cannot make money until your vehicle is repaired so lost wages is a major point. Medical Costs: You should not have to burden the cost of medical treatment if you were injured by a negligent driver. Rental Car: You can’t use a rental car to drive for Uber or Lyft but you will still need transportation while your personal vehicle is being repaired. Do I have legal options if I was involved in an accident? If you happen to fall victim to an Uber or a similar ride-share car accident then the lawyers at Adley Law Firm are here to help. Our lawyers are skilled in ride-share car accidents and have experience in handling ride-share cases. PIP and uninsured/underinsured motorist (UIM) coverage as required by law. PIP and UIM coverage as required by law. Uber and Lyft are required by the state to provide a minimum insurance coverage according to the HB221 bill. In the event of an accident the insurance coverage plans for Uber and Lyft are similar but differences rely on different situations of app usage and the status of the ride. When the ride-share app is off and inactive it is up to the driver to use their own insurance plan in the event of an accident. It is also required for the drivers that utilize Uber and Lyft to have their own insurance plans in case of an accident. If a driver gets into an accident while actively searching for a ride request and it is their fault then the ride-share service insurance will cover liability damage with $50,000 for injuries per person and $100,000 total for the accident with $25,000 for property damage. However, this coverage only applies if the drivers insurance does not equal or exceed a greater level of coverage. The drivers personal insurance company is liable of any damages like collision damage to the car, medical expenses caused by injuries, and any lost wages due to the accident and/or injuries sustained from the ride-share accident. It should be noted that many freelance drivers prefer to get their own ride-share insurance plan because they are covered by their insurance company in the event of an accident. The ride-share app provides coverage for both the driver and the passenger from the moment the driver accepts the riders request, when in route to the destination, and when the passenger arrives to their destination. Both Uber and Lyft provide third party liability coverage of at least 1 million dollars per accident involving damages to other drivers, pedestrians, passengers, and property. Uber and Lyft also provide bodily injury coverage to uninsured or underinsured motorist drivers of at least 1 million dollars. The insurance coverage covers anyone in the vehicle when another motorist is at fault and does not have insurance or does not have enough insurance to cover the damages. The insurance also covers hit and runs. If a driver has insurance that covers collision accidents, they are then eligible for contingent collision and comprehensive coverage. The limit of this coverage is up to the cash value of the vehicle with a $1,000 deductible. Can I lose my access to Uber or Lyft if I make a claim? Drivers and consumers will not lose access to Uber or Lyft services if they make a claim so there is no need to worry. Uber and Lyft use large insurance companies to cover any claims so that the claims do not impact them in anyway. They also pay a portion of each fare directly to their insurance company to avoid any damage to the company. If your claim is valid, documented properly by the authorities, such as police, ambulance, fire rescue, and medical doctors, then it will be given the respect it needs. Who drives Uber or Lyft cars? Uber, Lyft and other similar ride-share companies are driven by freelance drivers. Each driver has a background check ran to ensure the passengers are in safe hands. Adley Law Firm is a personal injury law firm based in Houston, Texas specializing in ride share accident cases. Being in a city with a population of over 6 million has enabled us to defend and protect hundreds of victims involved in a ride share accident. No matter where you live, give us a ring, send us an email, or click the button below to schedule a free consultation with a ride share attorney ready to fight for your recovery. There is no fee to talk or work with us as we operate on a contingency fee basis. If the other party is at fault, you may be entitled to compensation covering the points above, but you will need to work with the insurance company and those involved. Due to the complexity of a ride share accident case, it is highly advised to work with a lawyer who understands how to handle the case. A car accident lawyer will be able to negotiate a much higher settlement, even after their legal fees.